Texas Belle RSVP set includes a petite A1 size card (3.5 inches x 5 inches) made from matching 100% cotton Crane Lettra cardstock. Very handsome paper - nice texture and feels good to the hand. Matching A1 (also known as 4 Bar size) envelope of softwhite 50% PCW recycled paper. Color matches the Texas Belle mailing envelope. If we print, then the cards come cut to size. If you print, the cardstock comes 7 inches x 10 inches. You print 4 cards on a sheet and cut. Printing templates are to this size. Any extra petals of Blue Bonnet can be glued as an accent. Really pretty! DIY printable Crane cotton cardstock. The invitation and envelope are made in the US. Pressed Texas Bluebonnet real flower. (Flexible flower - holds up very well!) This design works very well with modern wedding graphics, offering a very large canvas measuring 7 3/4 inches by 5 1/2 inches wide. (A8 size) ECO PAPER FACTS: 100% cotton cards, mulberry unryu envelope liner, envelopes are 100% recycled, with 50% PCW. Matching purple mulberry envelope liner. Very handsome. Treefree, other than the envelope. Overall Size: 5-1/2 x 8 inches. Large pressed sprig of pressed Texas Bluebonnet. 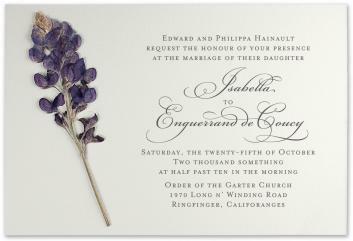 Handsome A8 softwhite envelope with matching purple mulberry envelope liner. Colors: Softwhite and eggplant purple. Flower: Real larkspur flower. Don't worry - we include extras. Artwork: Graphic designs. Coming soon! Gluestick: For gluing flower and envelope liner. Extra Paper: 10% extra printing paper and envelopes for printing errors.